Please do not give up. I can truly understand. The reason I began this blog was my broken heart. I was longing for a man who went away. Every morning I would wake up with his face in my mind...and I felt a constant physical ache in my belly....constant...real pain. It was hard to breathe sometimes. I felt like I was living in a nightmare...in the world of hunger. I could not get him out of my mind. Because of the suffering I went through then...and my fierce determination to change my life from the INSIDE so that I would never ever experience this intense pain again...this blog was born, and so was my incredibly beautiful life that I have now. The broken heart spurred me to chant 2 hours a day and sit in front of the Gohonzon chanting from the bottom of my soul to CHANGE MY KARMA FOREVER....to CHANGE WHATEVER WAS IN MY LIFE THAT ATTRACTED THIS HEARTACHE....to tear the ROOT of my suffering where men were concerned OUT of my life, AND to LOVE MYSELF SO MUCH....and most of all to USE my victory to prove the power of the Gohonzon (my own life), inspire others to rise from their own suffering and that this kind of pain would go away forever. Forever. I chanted to raise my life condition because I was in the world of hunger, or the world of hungry spirits. That is the closest world to hell as many of us know. In the world of hunger there is insatiable desire. I chanted with all my heart to raise my life condition and experience life as the Buddha I am. Of course I spent a lot of time chanting to get him back too...because I wanted him back, and believe that chanting sincerely for what you really want is the fuel that fires all your results in life. So I chanted to have him back...and I did get him back...for a time. But in my heart I knew that this relationship was just not meant to be...and gradually, over time, eventually moved on. I embraced my SGI district and chanted for each person every day. I chanted to change the heartache in my life for the sake of every woman who ever suffered in this way. I really know how you feel. If you can sit in front of your Gohonzon and chant resonant Nam-myoho-renge-kyo for exactly what you desire...you will win. Don't worry if your desire is "correct"...ALL your desires are correct. They are yours. Chant from the bottom of your heart. USE THIS PAIN TO FUEL YOUR BEAUTIFUL FUTURE! Here I am now...I have my own sweet, beautiful little apartment in a gorgeous area with a pond, a pool and a health club. I have a miraculous new job where I am able to really have an impact. I have many friends, and a really happy life. And my happiness doesn't depend on anyone or anything. My focus is on doing my own human revolution, knowing that any real change happens within my life and is reflected on the outside in everything and everyone. That is the real key in life. 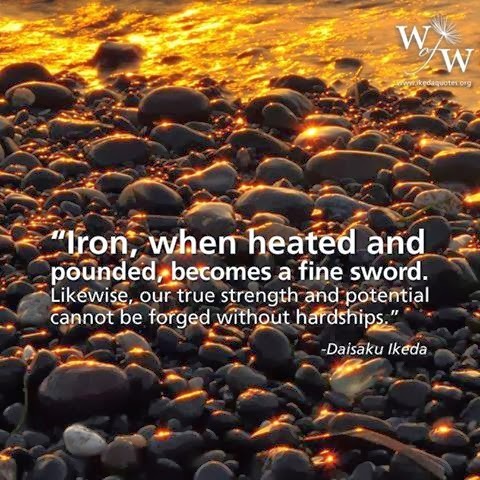 Follow President Ikeda's Guidance. Chant for those you love...and those you don't love...and you WILL free yourself from this pain. I promise. If I can do it so can you! Hi Jamie, do you have any advice on attracting a soul mate through chanting? I have been looking for the right person for soooo long and I have finally come to the realization that maybe I am supposed to use my practice instead of the usual dating circus to find the best man for me. Hi - I did a round of 5days, chanting 5 Hours each day in May 2003 and a few months later I met a wonderful person. We are married and despite going through all sorts of problems we stuck together and I can say confidently this is my first non abusive relationship since record began! I was single between 1998 and 2003 and in 2002 had met a chief liar. In five months he almost undid all my confidence. I did not think people like that even existed! So anyway this is to say I'm very grateful to have met him. It scared me out of having a relationship at all costs. You can be happy on your own is what I think, and good friends you meet through this practice (and others). Hello Jamie. Thank you so much for your inspiring blogs. I often share them on my facebook and twitter to help others. I am launching my own radio station on the internet with the intention of spreading not only healing emotive music for a hurting world but also for Kosen Rufu. You are truly a buddha :). Thank you so much for your blog, I do find your words so supportive and encouraging. I printed this letter and look at it every time I chant. Thanks so much for this. I'm so excited for my life to turn from winter to spring. At this point, you're post is over three years old. As I sit on my sofa, drunk and crying over my broken heart, I want you to know that your message is still being heard by people that need it. Thank you for helping me feel like I am not alone. I really enjoy your blog Jamie!